bellavista® 1000, Intensive care ventilator offers the highest ventilator performance and revolutionary operation, with integrated diagnostic capabilities that elevate bellavista to a new standard in the respiratory care field. Whether invasive, non-invasive, mask or tube, with or without exhalation valve, bellavista ventilates with any patient circuit system - for every ventilation therapy. Numerous manoeuvres and ventilation concepts developed with experts improve therapy success. Due to its compact size and lightweight design, bellavista is the excellent device for intermediate care units and for intra-hospital transfer. 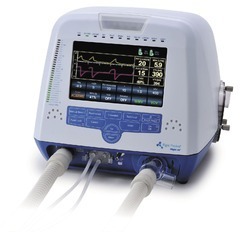 Looking for Ventilator- ICU Care High End ?